Preheat the oven to 350 degrees F. Grease or line baking cups in the muffin pan. Using a stand or electric mixer (or mix by hand) mix together flour, baking powder, baking soda, salt, scallions, cheese and bacon. In a medium bowl whisk butter, egg and buttermilk until combined. Slowly pour the buttermilk mixture into the flour mixture and stir until just moistened. Do not overmix. Spoon batter (I used a 3-tablespoons large cookie scoop) into the greased or lined muffin cups and bake for 17-20 minutes or until toothpick/tester inserted into the center comes out clean. Cool slightly, about 5-7 minutes and serve warm or at room temperature (best served warm). Savory muffins are kind of one of my favorite things since they feel like a treat, but not so bad for you? I especially love the spice here! And congrats to your mom-in-law! I love savoury muffins, esp. when they are packed with wholesome ingredients like this one. Have some fun with weekend cleaning, Anne. 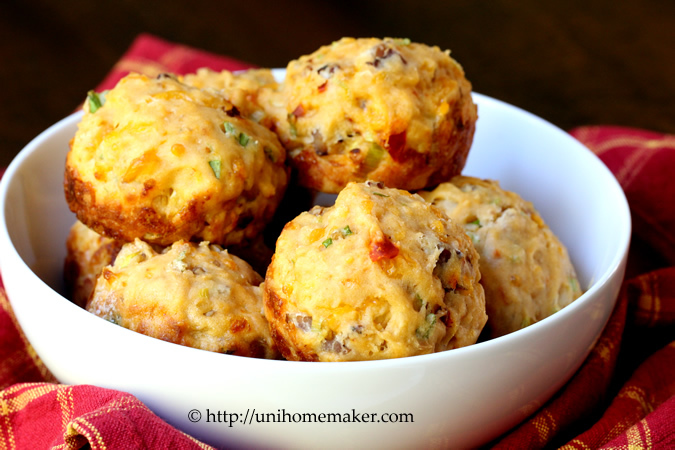 I like savory muffins and these are jammed packed! Great recipe – I’m cleaning my house today too… my daughter, husband and granddaughter (5 weeks) are coming for their first visit! Have a great weekend!! Beautiful savory muffins, Anne! And, such wonderful news for your mother-in-law. I hope she will be happy. Thanks for sharing and have a great weekend! Pinning! Congrats to your MIL. The muffins look mighty tasty. Savory muffins are the best. I don’t know why more bakeries don’t sell them. They look really tasty! Wonderful combination of cheese, bacon and chilli butter. Congrats to your mother in law! And these muffins… I want one (or a dozen) so bad right now!! Definitely going to make these for a dinner soon! Will be eating them left and right I’m sure! Congrats to your mom-in-law, Anne! Seriously?… These are the best looking muffins I’ve ever seen! They are fabulous! I love the ingredient list. I’ll bet they tasted amazing! They are on my must-make list! I love your style and taste in the kitchen. These muffins are exactly the type of thing I would have a severe problem with 🙂 Congrats to your mom-in-law and btw, I also admire your spirit of good will, can you put a recipe out for that too please? Hope you have a great weekend!! 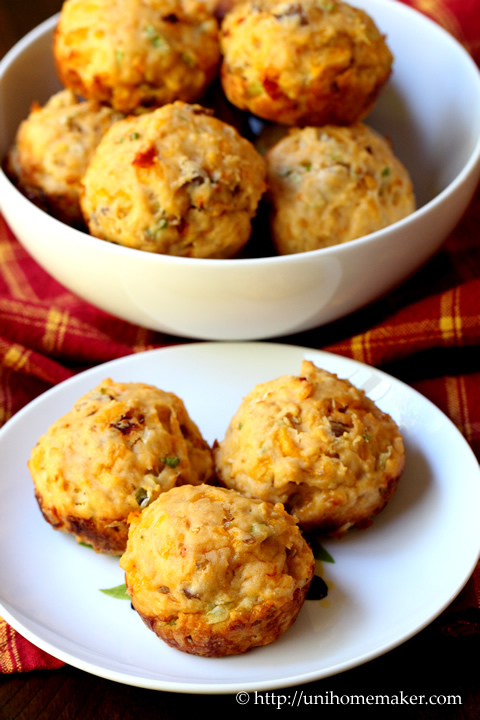 What a yummy-sounding savory muffin–I know I would love these! That is such happy news about your mother in law. I wish her lots of love and happiness! I love how you reward yourself after cleaning! These have to be so good right out of the oven. Enjoy your weekend. Perfect to serve with soups now that the cooler weather is here. Great flavor – lovely colors! 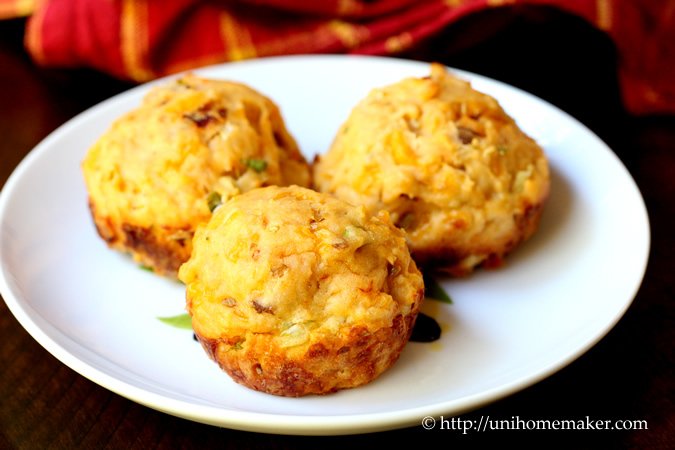 I’ve been looking for a good cheese muffin recipe, this looks great and will be sure to try! Hope you are having a good weekend! Congrats to your MIL! And my oh my, these little muffins look amazing! I love garlic and chipotle. And you can’t go wrong with bacon and cheddar! Pinned! Hope you are enjoying your weekend, Anne! These sound like the perfect snack to have with drinks! We have a French exchange student staying with us at the moment – the house has been cleaned from top to bottom! I wish I’d had some of these muffins to look forward to when the work was finished though! This is a tasty snack indeed! savory muffins is always a great idea! And its tempting me to dig in! I much prefer savory muffins to sweet (although I certainly don’t turn up my nose at sweet ones!). Love the texture of these. Really good recipe – thanks. Congrats to your mother in law! Hope your cleaning doesn’t take long, Anne. 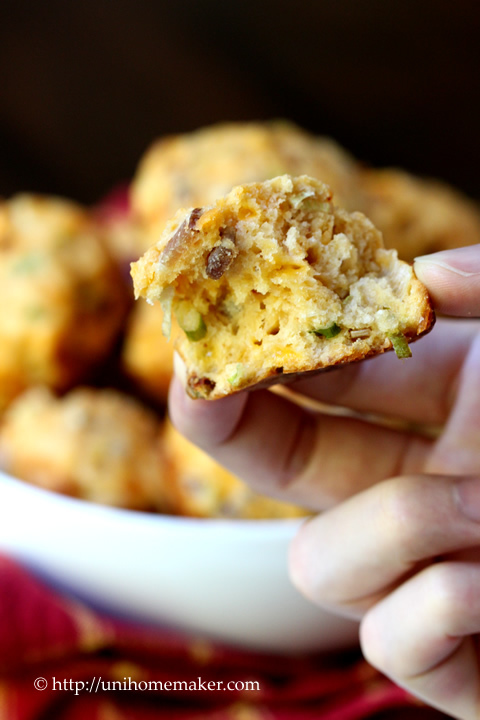 These savory muffins look amazing — I love the spice! Oh my…your muffins sound wonderful. I know my husband would be crazy about them. 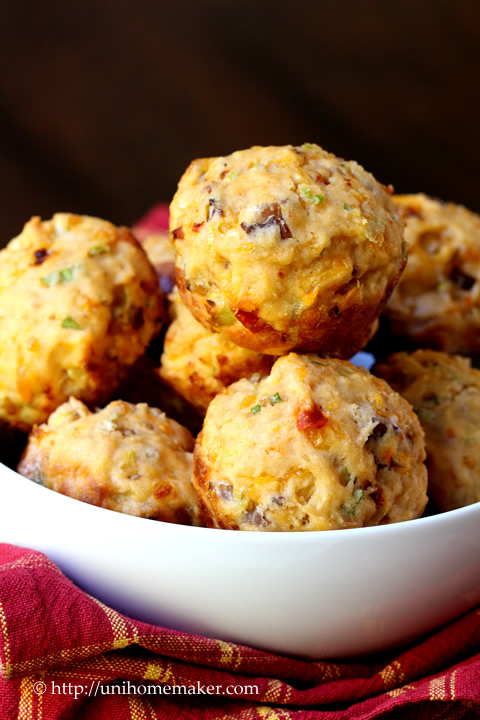 I love savoury muffins so these look right up my street. Delish! So many great flavors going on in these muffins! I think I’m in love! Great sustenance for house cleaning. Congrats to your mother-in-law! these, and some peppery butter 😀 congratulations and good luck to your mother in law! Oooh yes, great call. Peppery butter would be awesome on this. Thanks for sharing this recipe – made them this morning for breakfast and although the SO (Significant Other) was a little taken aback as he wasn’t expecting a “savoury” muffin, definitely a recipe to make again….